On distributions that support NetworkManager, pptpconfig is deprecated in favour of the PPTP Plugin for Network Manager. On Ubuntu and derivatives the package name is network-manager-pptp. See the Debian bug #390708 for the request for packaging. 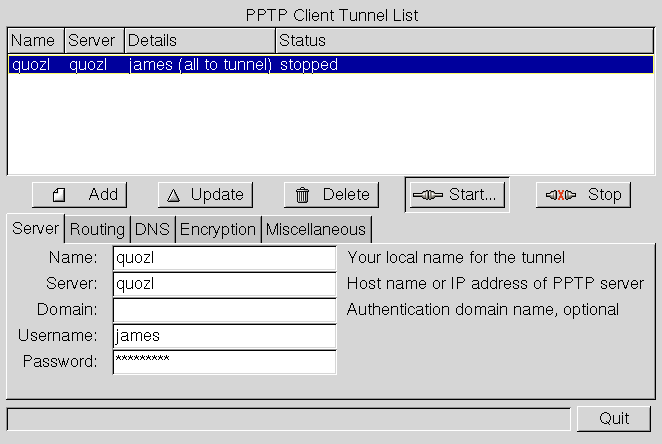 A program for configuration and management of PPTP Client tunnels on Linux. Tested by me so far on Debian (sarge) and Fedora Core 2. Further test reports welcome. Please report success or failure to the pptpclient-devel mailing list. As of version 20060410 (no material change for two years).